Although the King of Snacks, Potato Chips and Crisps do have some friends on the snack shelves or your local stores and supermarkets. As the name implies, Pork Rinds are all about fried pig skin. Animal fat was the earliest form of cooking oil so it is possible that Pork Rinds are the original snack food. Low in carbohydrates and high in protein, they can be used as part of the Atkins Diet. Most of the unsaturated fat is Oleic Acid, which is the same healthy fat that exists in Olive Oil. They do however have around five times as much salt as the average bag of Potato Chips or Crisps. 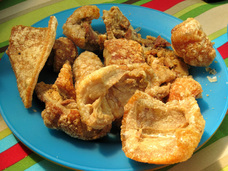 In the UK the delicacy is known as Pork Scratchings in many South American countries it is known as Chicharron. Mexico is one the biggest producers and consumers of the snack food – Barcel and Sabritas even manufacture ‘wheat’ Chicharron. Other names include; Canada: Scrunchions, France: Grattons, Thailand: Khaep Mu, Vietname: Top Mo, Netherlands: Knabbelspek. Probably originating in Germany well over a millennium ago, a Pretzel, or Brezel, as it is known, is a baked dough food made from wheat flour, water and yeast and moulded into a knot shape. They were introduced to American by the Pennsylvania Dutch during the 19th century. Their popularity spread and both savoury and sweet versions became popular. What were a street vendor food item became a convenience snack food that is worth more than half a billion dollars a year to the industry. 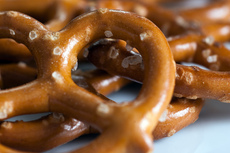 Pennsylvania is still responsible for the manufacture of 80% of the nation’s Pretzels. Jerky is fat trimmed lean meat, invariably beef - that is cut into strips, salted and dried before being marinated in seasoned spices or liquids and sauces for flavoring. The salt inhibits the bacterial growth. 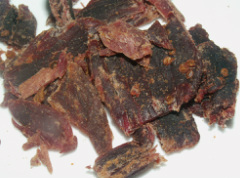 The fundamental difference with Biltong is the salt used in curing instead of vinegar. In South Africa a wide variety of animal meat is used including, springbok, kudu and buffalo.